Blind And Gifted? Blind And Gifted! From the Editor: Stephanie Kieszak-Holloway is a statistician with the Centers for Disease Control and Prevention (CDC) in Atlanta. She serves as president of the Georgia Organization of Parents of Blind Children (GOPBC) and is a member of the board of the National Organization of Parents of Blind Children (NOPBC). "What would Kendra get out of being in the gifted program that she wouldn't get out of just being in the regular classroom?" Believe it or not, that question was posed by the DeKalb County, Georgia, Gifted Coordinator. It sums up the attitude we encountered in our battle to have our daughter, who is blind, fairly evaluated for her school's program for gifted students. The battle never should have escalated as it did, but we knew it was worth fighting. I hope that our experience will help other parents understand that they must often work long and hard to get their blind children the education they deserve. Early in the 2009-2010 school year, when Kendra was in first grade, I received a call from her teacher of the visually impaired (TVI). The TVI explained that neither the Iowa Test of Basic Skills (ITBS) nor the Cognitive Abilities Test (CogAT) were available in Braille for first graders. (The ITBS is available in Braille for later grades). In our county, all first, third, and fifth graders are given these tests to determine their eligibility for the gifted program. I was concerned about how to ensure that Kendra was fairly evaluated. I contacted the County Gifted Program Coordinator to ask about alternatives to the ITBS and CogAT. I also asked for suggestions on the Blindkid and Professionals in Blindness Education listservs, both sponsored by the National Federation of the Blind (NFB). Little did I know that identifying an appropriate achievement test battery would turn out to be the easiest step in the process. The Low Incidence Special Education Coordinator for DeKalb County and the Assistant Director at the Georgia Academy for the Blind (GAB) helped identify a suitable achievement test battery for Kendra. In early December of 2009, I was notified that the achievement test was now available and that the school psychologist was being contacted to formulate a plan for an alternative to the CogAT. The standardized achievement test that had been chosen was the Braille adaptation of the Woodcock-Johnson III Normative Update Tests of Achievement (WJ III ACH-Braille), which Kendra's TVI administered. On January 25, 2010, Kendra met with the school psychologist and was administered a verbal aptitude test as an alternative to the CogAT. In March of 2010 I was notified that Kendra was deemed ineligible for the gifted program based on her test scores. I was very surprised by the decision, and I had no intention of letting the matter drop. I sent an email to the assistant principal and the teacher of the gifted, expressing my concerns about the testing process and asking for clarification on certain points. I included links to websites regarding the criteria for identification of giftedness in students who are blind. In response I received an email from the teacher of the gifted, once again denying Kendra's eligibility. The email did not address any of the concerns I had raised. The Gifted Program Coordinator simply re-stated Kendra's test scores. On April 12, I sent an email to a number of school and county officials, requesting an in-person meeting. Following are excerpts from my letter. "While the need for this meeting is prompted by my concern for my own child, I believe there is a larger issue involved. As president of the Georgia Organization of Parents of Blind Children (GOPBC) and a board member of the National Organization of Parents of Blind Children (NOPBC), other parents of blind/visually impaired children frequently ask me about eligibility for gifted programs. I have heard many examples over the past several years of blind children being denied access to programs for the gifted. This is due, in part, to confusion as to how to appropriately test these children. As a statistician by profession, I have concerns regarding the use of any standardized test without appropriate interpretation of the results by someone familiar with the effects of blindness on the scores. . . .
"The literature is very clear on the many problems associated with using standardized tests with blind children. Even the questions on tests such as the Braille adaptation of the Woodcock-Johnson are likely to be influenced by a visual bias. I found support for this while conducting my own research on the use of standardized tests with blind children. According to documentation for the WJ III ACH-Braille, for example, 'Scores on tests designed for and standardized on the general population should be interpreted with great caution. It is possible, if not likely, that they are underestimates of ability because of the visual bias of many of the verbal items. Because blind subjects' scores are derived from norms for sighted subjects, the resultant scores should never be used as a sole determinant to exclude a blind subject from any program or opportunity in the educational setting or the community' (p. 7: WJ III ACH-Braille Supplementary Manual, provided by Dr. Lynne Jaffe.)" I learned of the work of Dr. Lynne Jaffe and another expert on blindness and giftedness, Dr. Carol Evans, while I was exploring the issue of the testing of blind students. In my letter to the school officials I described some of their findings and included the link to information regarding Dr. Jaffe's background, particularly as related to the Woodcock-Johnson III test. I explained that Dr. Jaffe had reviewed Kendra's test scores. "It is true that Kendra's age normed percentile for reading was 85," I wrote. "However, her grade normed percentile for reading was 97. Dr. Jaffe explained that she always runs both sets of scores for a student (unless a student has been held back) and that the grade norms were more appropriate because they take into account years of school experience. 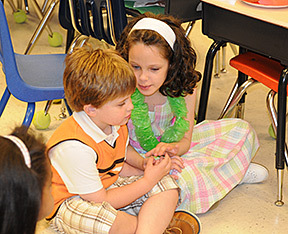 In Kendra's case, her September 11th birthday puts her on the older end of first graders. This is reflected in the discrepancy between the age and grade normed scores. Kendra did qualify in the area of achievement based on percentile rankings by grade (97th percentile in reading)." I pointed out that Dr. Jaffe suggested looking at the particular items that Kendra missed to see if a visual bias was responsible. I further noted, "The documentation for the WJ III ACH-Braille, as I understand from my discussions with Dr. Jaffe, specifies the manner and conditions in which the test is to be administered. For example, the manual states that the test should be administered at least twice with blind subjects before administering it for the purpose of using the scores and analyzing the results (p. 6). That was not done for Kendra. While I do not believe this had a big impact on her scores, it is worth keeping in mind for future administrations of the test to other students." In addition, I requested that Kendra be assessed with the WISC-IV; I had learned that the WISC-IV is regarded as a better assessment tool for blind subjects than the DAS II, which Kendra had taken with the psychologist. "Blindness in children is, as you know, a low incidence disability," I concluded. "The number of children who are both blind and gifted is therefore also extremely low. There has not been much research done on this group, but the research that has been done recommends a review of the child's portfolio of work and evaluations by the teachers who know the child well. Kendra has always been one of the higher achievers in her classes. She won the Braille Readers Are Leaders Contest (a national contest) two years in a row and this year placed second in the Georgia Regional Braille Challenge. This year, only she and one other child are doing advanced work in the classroom (fourth- to fifth-grade spelling words and more advanced reading assignments). "Teaching a blind student may be intimidating for a teacher who has never done it before. My roles in the GOPBC and NOPBC have given me the opportunity to communicate with other parents of blind and gifted students. Some of these parents have already volunteered to provide information to Kendra's teachers about things that have been done to make the gifted program a success. It is well known by Kendra's past and present teachers that my husband and I have always been very happy and eager to serve as resources. If we do not have a solution to a problem which may arise, we have the entire membership of the National Federation of the Blind (NFB) and NOPBC to fall back on for support. Believe me when I tell you that providing support for the education of blind children is a high priority for both those organizations. "My husband and I are not asking for automatic entry into the gifted program for Kendra. We are asking that she be evaluated fairly and in light of published recommendations regarding the identification of blind/gifted students." The in-person meeting I requested took place on May 3, 2010. One of the main points I raised was the use of grade norms rather than age norms for the achievement test. Kendra's birthday is in early September, so she just missed the cutoff for school entry by a few days. She has therefore always been one of the oldest children in her class. There was a large discrepancy between her grade-based and age-based WJ III ACH-Braille scores (percentile rank 97 and 85, respectively). The school chose the lower, age-based score while we argued that the higher, grade-based score was more appropriate. I could not get anyone in the meeting to agree out loud that a grade-based score would be accepted. The day after our meeting, I contacted the program specialist for gifted education at the Georgia Department of Education for clarification on the use of grade norms versus age norms on the WJ III Tests of Achievement. She explained that, in the area of mental ability, the age-based scores must be used, even if both are available. In the area of achievement, however, either age- or grade-based scores may be used. Therefore, the state agreed (at that time) that either age- or grade-normed scores could be used for the achievement test criteria. Foolishly, I thought we were close to victory. Two days later, I emailed the program specialist for gifted education and the director of student support services in DeKalb County. After reviewing the May 3rd meeting and my exchange with the program specialist, I stated, "The meeting ended with an assurance from our principal that my daughter, Kendra Holloway, would be placed with the other gifted students next year in second grade. We believe that the principal was sincere in his efforts to do the right thing for Kendra, but we were uneasy about her not receiving the official classification of gifted. We did not pursue it further at that time because nobody present at that meeting responded affirmatively when asked whether the grade norms for Kendra's achievement test were admissible. If they are, she then qualifies on two of the four criteria and should be tested further. She was not tested at all for motivation, and it is our assertion that she should have received an alternative test for mental ability. At this point, we are requesting that she be assessed for motivation using a portfolio of her work, and that she be tested for mental ability using the WISC-IV. "I have spent an incredible amount of my time researching these questions and contacting various people. While I am always willing to do anything I can to help my daughter succeed, it should not have been necessary for me to go to these lengths. I am hoping that we can resolve this before the school year ends. Please provide the name of the person who will be able to take the lead in addressing our concerns so that we may move forward." I received the following reply from the program specialist. "Yes, I have spoken with the county program gifted coordinator and confirmed that DeKalb County followed procedures outlined in the Georgia Gifted Education Resource Guide. It appears that the principal made a positive decision on Kendra's class placement for next year." I truly could not believe what I had read. To this day, I'm still amazed at the complete about-face in her position regarding the use of grade-based scores. Even though the principal had said he would place Kendra with the other gifted students in the second grade, we did not consider this a "positive decision." We wanted the official designation of gifted and the assurance that Kendra would remain in the program in the coming years. If you've read this far, you have probably figured out that I had no intention of giving up until the question of eligibility was handled to my satisfaction. I knew we were right, and I knew Kendra qualified for the gifted program according to the state guidelines. I sent this email to all involved on May 12th, 2010, "I found out this afternoon that my daughter Kendra Holloway's score on the Renzulli scale of motivation was 96 percent. In addition, her score on the Renzulli scale of creativity was 98 percent, and her reading score on the Woodcock-Johnson III Tests of Achievement-Braille Adaptation was in the 97th percentile. 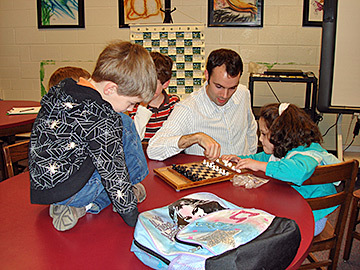 She therefore meets the criteria for the gifted program as set forth in the Georgia Education Resource Manual (scores above 90 in three of the four assessment areas). I am confident that now that we are all aware of the fact that she actually qualifies for the gifted program, we can move forward with officially classifying her as a gifted student and preparing for her entry into the program this coming fall." The program specialist for gifted education followed up the next day with an email saying that most districts have a policy prohibiting the use of rating scales in more than one area. In other words, if a scale is used to qualify a student in creativity, it cannot be used to qualify the student in motivation. Despite a string of other emails between me and various county and state administrators, I felt I was not making any progress. Finally I requested a mediator. Looking back, I probably should have done so sooner, but I just continued to believe that people would do the right thing. I referred the mediator to information on the website of the Georgia Secretary of State (160-4-2-.38 Education Program for Gifted Students, Amended). I listed Kendra's test scores and pointed out that she met the eligibility criteria in three of the four areas (achievement, creativity, and motivation). I explained that I had saved all of the relevant correspondence, including an email from the program specialist for gifted education, confirming that either age- or grade-normed values could be used. I included information from a Q&A on the state website regarding the prohibition against using rating scales in more than one area. According to the website, "... this restriction does not apply to two separate scales that measure two different constructs, even if those two scales are included in the same larger instrument." Particular attention should be given to potentially gifted students from culturally diverse, economically disadvantaged (ED), or disability populations during the student talent search process, to make sure that nontraditional gifted students are recognized and given a chance to receive a thorough evaluation needed to establish their eligibility. Although the multiple-criteria rule (160-4-2-.38) has allowed Georgia educators to make progress in identifying gifted students more fairly, it is necessary to continue guarding against the potential barriers to the recognition and development of giftedness among underrepresented students. Often such barriers are related to attitudes and access." On May 20th, 2010, the mediator sent the county gifted coordinator a list of questions she needed to address based on points I had raised in my email. The mediator also outlined several things that needed to take place very early in the 2010-2011 school year to get Kendra officially placed in the program. Finally, on Friday, May 21st, 2010 (the last day of school), I received a phone call from the Low Incidence Special Education Coordinator. I was in Kendra's classroom for the end-of-school party when the call came in, and I recall the coordinator saying that I was going to be very pleased when I heard her news. All of a sudden, the county agreed that Kendra was eligible for the gifted program after all! She didn't need to take any additional tests, and she would start the program in the fall. Most importantly, I could stop sending lengthy, detailed emails to people! I first inquired about gifted program eligibility in September of 2009. In May of 2010 we finally received a favorable decision. Why did it take so long? Why did my daughter have to miss out on a year of being in the program? The facts never changed. Kendra's scores didn't change. I am incredibly grateful to the many people who provided support and guidance, and who believed, as I did, that Kendra belonged in the program. I would like to say that I am no longer angry at those who put up unnecessary roadblocks during this process. I would like to, but I can't. I do not know what motivated such behavior. Was it fear of not knowing how to teach a blind child? Was it pure ignorance? Or was it a belief that a blind child didn't belong in a program for gifted children? When I was first asked to write this article, I hesitated. I knew it would be a difficult piece to write, and I knew it would stir up a lot of emotions as I looked through all my old notes and emails. This piece is not meant to be a blueprint for anyone else to follow. Rather, I hope it will show other parents that even when you have all the information and "right" on your side, it might still take a great deal of time and effort to obtain what your child deserves. Kendra is approaching the end of fourth grade and remains in the gifted program. I am happy to report that she continues to do very well in school. Her success in the program makes the year-long battle worthwhile.